Eminently readable historical fiction marred by a dubious heroine and lack of atmosphere. Stacey Halls debut historical novel is a fictionalised account of the Pendle witch trials in 17th-century Lancashire and with a cast of characters drawn from real-life events and a plucky young heroine in seventeen-year-old Fleetwood Shuttleworth challenging the perceptions of the era, it should have had all the ingredients for a gripping drama. 1612 and the young mistress of palatial Gawthorpe Hall that overlooks the imposing Lancastrian landscape is expecting for the fourth time. With a healthy baby yet to come to fruition and a desire to demonstrate her gratitude to older, wealthy and widely admired husband, Richard, she longs to produce the heir he yearns for. In choosing Fleetwood to be his wife, Richard has given her an escape from the austere confines of her childhood home, a domineering mother and the harrowing memory of a first marriage at the age of four. When Fleetwood stumbles across a letter from a physician making apparent the fact that another baby would be the death of her and the prospect of survival is unlikely, she descends into a spiral of suspicion and turmoil... could her husband have kept the letter from her? Intent on bearing a healthy baby and cementing her position as Mistress Shuttleworth, a desperate Fleetwood encounters a unsettling local woman who claims to be a midwife in Alice Grey. Resourceful yet not easily drawn outside of her self-contained demeanour, Alice claims that she will ensure Fleetwood delivers a healthy baby and survives and, when early signs of her treatments are positive it convinces Fleetwood that only Alice can make certain of a safe delivery. But when Alice is caught in the crossfire of the witch trials and stands accused of witchcraft by Roger Nowell, a former sheriff and father figure to Richard, matters become personal. As Roger’s quest for power is countered by Fleetwood’s determination to ensure Alice is saved from the rope and by her side when she gives birth a fraught power struggle ensues. Believing yet having no firm knowledge that Alice is innocent of the charges made against her, a heavily pregnant Fleetwood sets out to prove it.. I found plucky Fleetwood Shuttleworth a difficult lead protagonist to invest in and her rapid evolution from naive and uninformed mistress into having the wherewithal and confidence to challenge her husband, the high courts and the King of England is slightly incredulous. There is little supportive evidence to justify this transition from self absorbed young woman into pioneering precedent setter. Fleetwood lacks depth and I could not begin to care for her fate or connect with her first-person narrative. Not only was she disappointingly vapid, I could not instil belief in her actually commanding authority in what should have been a stirring denouement. Alongside her Alice Gray remains something of an enigma throughout the entire story and I felt that Stacey Halls made little of her potential for characterisation. Understanding Fleetwood’s passion when she did all the running in her relationship with somewhat surly Alice yet would have had limited exposure to witchcraft also feels dubious. Any sense of mutual friendship and commitment to each other is absent and as such, this feels like Fleetwood’s story with Alice and the witch trails a necessary sideshow. There is precious little insight into the women who stood trial as witches and their is little palpable atmosphere to what should be a tumultuous backdrop of anger and resentment. This spirit of the era feels largely absent and the supporting cast, with the exception of former magistrate and sheriff, Roger Nowell, are disappointingly lacking in character. 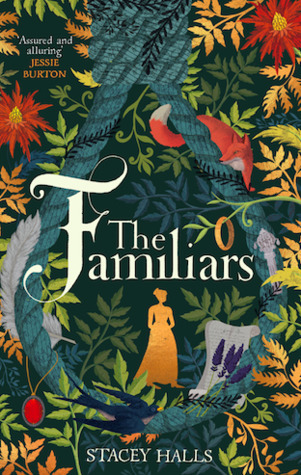 It is ambitious of Halls to tackle the topic of the Pendle witch trials when they have been covered so extensively by recent fiction novels and the bar set so high, and whilst The Familiars makes for a solid historical fiction debut I was far from convinced and sadly underwhelmed. As it stands the story feels like a simplified and rose-tinted attempt to capture the female empowerment movement and the eventual outcome feels all too obvious from the off. Limited in substance and slightly meandering in the first half, the idea that a seventeen-year-old Fleetwood would risk her life, that of her unborn child, her marriage and liberty for a woman with a few herbs and potentially supernatural powers is hard to swallow. Likewise her eventual indifference to her husbands deceits leaves conflicting emotions and for all Fleetwood’s uncompromising behaviour in challenging the misconceptions of the era, her casual acceptance of her husbands betrayal is the very antithesis of her vocal attitude in highlighting the injustices towards women in the era. Whilst the story has a coherent plot, proves solidly entertaining and gathers pace in the second half, there in limited depth and credibility to a novel that is principally Fleetwood’s story and lacks any real sense of atmosphere. With thanks to Readers First who provided me with a free copy of this novel in exchange for my honest and unbiased opinion. Sign into Goodreads to see if any of your friends have read The Familiars. Well I might have been interested in reading this but...after your excellent review, not so much. ah well, there are plenty of books out there. I hope your next one is a winner. Excellent review Rachel, seem to be mixed reviews for this one!